The New West Symphony is a professional orchestra that includes some of the most famous and accomplished musicians from around the globe. Our tenured orchestra members are OSCAR® and GRAMMY® nominated artists themselves, and can be heard on almost any film soundtrack you can imagine, from Jurassic Park to Star Wars to La La Land! 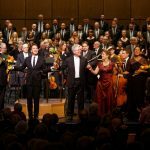 New West Symphony has postponed auditions originally scheduled for April 6, 2019. Proposed audition repertoire list is below. Rescheduled audition dates to be announced.